Bio-molecular dynamics (MD) simulations based on graphical processing units (GPUs) were first released to the public in the early 2009 with the code ACEMD. Almost 8 years after, applications now encompass a broad range of molecular studies, while throughput improvements have opened the way to millisecond sampling timescales. 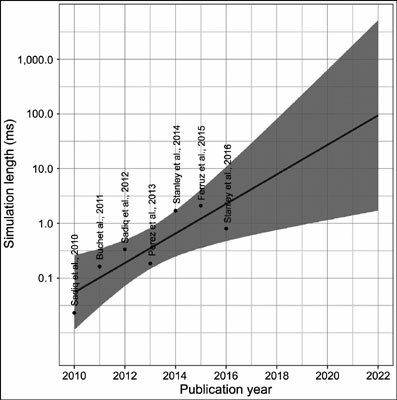 Based on an extrapolation of the amount of sampling in published literature, the second timescale will be reached by the year 2022, and therefore we predict that molecular dynamics is going to become one of the main tools in drug discovery in both academia and industry. Here, we review successful applications in the drug discovery domain developed over these recent years of GPU-based MD. We also retrospectively analyse limitations that have been overcome over the years and give a perspective on challenges that remain to be addressed. Keywords: Molecular dynamics, Simulation, Drug discovery, ACEMD, Perspective, Review, GPU. Keywords:Molecular dynamics, Simulation, Drug discovery, ACEMD, Perspective, Review, GPU. Abstract:Bio-molecular dynamics (MD) simulations based on graphical processing units (GPUs) were first released to the public in the early 2009 with the code ACEMD. Almost 8 years after, applications now encompass a broad range of molecular studies, while throughput improvements have opened the way to millisecond sampling timescales. Based on an extrapolation of the amount of sampling in published literature, the second timescale will be reached by the year 2022, and therefore we predict that molecular dynamics is going to become one of the main tools in drug discovery in both academia and industry. Here, we review successful applications in the drug discovery domain developed over these recent years of GPU-based MD. We also retrospectively analyse limitations that have been overcome over the years and give a perspective on challenges that remain to be addressed.